Ursa Major (Latin: "Larger She-Bear"; also known as the Great Bear) is a constellation visible throughout the year in most of the northern hemisphere. It can be seen best in the month of April. It is dominated by the widely recognized asterism known as the Big Dipper or the Plough, which is a useful pointer towards the north, and it has mythological significance in numerous world cultures. 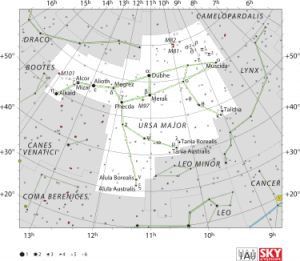 Ursa Major has been reconstructed as an Indo-European constellation.It was one of the 48 constellations listed by the 2nd century AD astronomer Ptolemy. It is mentioned by such poets as Homer, Spenser, Shakespeare and Tennyson. The Finnish epic Kalevala mentions it, Vincent van Gogh painted it, and Federico Garcia Lorca mentions in his poem "Song for the Moon" written August 1920. The seven brightest stars of Ursa Major form the asterism known as the Big Dipper in the USA and Canada, the Plough in the United Kingdom, the Großer Wagen in Germany & Austria and the Saptarshi in India. Six of these seven stars are of 2nd magnitude; just the central star is of 3rd magnitude. Another asterism known as the "Three Leaps of Gazelle" is recognized in Arab culture, a series of three pairs of stars: ν and ξ Ursae Majoris, Alula Borealis and Australis, the "first leap";λ and μ Ursae Majoris, Tania Borealis and Australis, the "second leap";ι and κ Ursae Majoris, Talitha Borealis and Australis, the "third leap". These stars are found along the southwest border of the constellation. Several bright galaxies are found in Ursa Major, including the pair Messier 81 (one of the brightest galaxies in the sky) and Messier 82 above the bear's head, and Pinwheel Galaxy. Messier 101, a spiral northeast of η Ursae Majoris. The spiral galaxies Messier 108 and Messier 109 are also found in this constellation. The bright planetary nebula Owl Nebula (M97) can be found along the bottom of the bowl of the Big Dipper. Messier 81 is a nearly face-on spiral galaxy 11.8 million light-years from Earth. Like most spiral galaxies, it has a core made up of old stars, with arms filled with young stars and nebulae. Along with M82, it is a part of the galaxy cluster closest to the Local Group. Messier 82 is a galaxy that is interacting gravitationally with M81. It is the brightest infrared galaxy in the sky. SN 2014J, an apparent Type Ia supernova, was observed in M82 on 21 January 2014. Messier 97, also called the Owl Nebula, is a planetary nebula 1,630 light-years from Earth; it has a magnitude of approximately 10. It was discovered in 1781 by Pierre Méchain. Messier 101, also called the Pinwheel Galaxy, is a face-on spiral galaxy located 25 million light-years from Earth. It was discovered by Pierre Méchain in 1781. Its spiral arms have regions with extensive star formation and have strong ultraviolet emissions. It has an integrated magnitude of 7.5, making it visible in both binoculars and telescopes, but not to the naked eye. NGC 2787 is a lenticular galaxy at a distance of 24 million light-years. Unlike most lenticular galaxies, NGC 2787 has a bar at its center. It also has a halo of globular clusters, indicating its age and relative stability. NGC 3079 is a starburst spiral galaxy located 52 million light-years from Earth. It has a horseshoe-shaped structure at its center that indicates the presence of a supermassive black hole. The structure itself is formed by superwinds from the black hole. NGC 3310 is another starburst spiral galaxy located 50 million light-years from Earth. Its bright white color is caused by its higher than usual rate of star formation, which began 100 million years ago after a merger. Studies of this and other starburst galaxies have shown that their starburst phase can last for hundreds of millions of years, far longer than was previously assumed. NGC 4013 is an edge-on spiral galaxy located 55 million light-years from Earth. It has a prominent dust lane and has several visible star forming regions. I Zwicky 18 is a young dwarf galaxy at a distance of 45 million light-years. The youngest known galaxy in the visible universe, I Zwicky 18 is about 4 million years old, about one-thousandth the age of the Solar System. It is filled with star forming regions which are creating many hot, young, blue stars at a very high rate. The Hubble Deep Field is located to the northeast of δ Ursae Majoris. The constellation of Ursa Major has been seen as a bear by many distinct civilizations. This may stem from a common oral tradition stretching back more than 13,000 years. Using statistical and phylogenetic tools, Julien d'Huy reconstructs the following Palaeolithic state of the story: "There is an animal that is a horned herbivore, especially an elk. One human pursues this ungulate. The hunt locates or get to the sky. The animal is alive when it is transformed into a constellation. It forms the Big Dipper". In Burmese, Pucwan Tārā (pronounced "bazun taja") is the name of a constellation comprising stars from the head and forelegs of Ursa Major; pucwan is a general term for a crustacean, such as prawn, shrimp, crab, lobster, etc. In Roman mythology, Jupiter (the king of the gods) lusts after a young woman named Callisto, a nymph of Diana. Juno, Jupiter' jealous wife, transforms the beautiful Callisto into a bear. Callisto, while in bear form, later encounters her son Arcas. Arcas almost shoots the bear, but to avert the tragedy, Jupiter turns them into bears and puts them in the sky, forming Ursa Major and Ursa Minor. Callisto is Ursa Major and her son, Arcas, is Ursa Minor. In ancient times the name of the constellation was Helike, ("turning"), because it turns around the Pole. In Book Two of Lucan it is called Parrhasian Helice, since Callisto came from Parrhasia in Arcadia, where the story is set. The Odyssey notes that it is the sole constellation that never sinks below the horizon and "bathes in the Ocean's waves", so it is used as a celestial reference point for navigation. It is also referred to as the "Wain". In Finnish language, the asterism is sometimes called with its old Finnish name, Otava. The meaning of the name has been almost forgotten in Modern Finnish; it means a salmon weir. The Iroquois Native Americans interpreted Alioth, Mizar, and Alkaid as three hunters pursuing the Great Bear. According to one version of their myth, the first hunter (Alioth) is carrying a bow and arrow to strike down the bear. The second hunter (Mizar) carries a large pot — the star Alcor — on his shoulder in which to cook the bear while the third hunter (Alkaid) hauls a pile of firewood to light a fire beneath the pot. The Wampanoag people(Algonquian) Native Americans referred to Ursa Major as "maske", meaning "bear" according to Thomas Morton in The New England Canaan.In Hinduism, Ursa Major is known as Saptarshi, each of the stars representing one of the Saptarshis or Seven Sages viz. Bhrigu, Atri, Angirasa, Vasishta, Pulastya, Pulalaha and Kratu. The fact that the two front stars of the constellations point to the pole star is explained as the boon given to the boy sage Dhruva by Lord Vishnu. In Javanese, as known as "Bintang Kartika". This name comes from Sanskrit which refers "krttikã" the same star cluster. In ancient Javanese this brightest seven stars are known as Lintang Wuluh, literally means "seven stars". This star clusters so popular because its emergence into the start time marker for planting. In South Korea, the constellation is referred to as "the seven stars of the north". In the related myth, a widow with seven sons found comfort with a widower, but to get to his house required crossing a stream. The seven sons, sympathetic to their mother, placed stepping stones in the river. Their mother, not knowing who put the stones in place, blessed them and, when they died, they became the constellation. Alkaid (Eta Ursae Majoris) has several nicknames : "Sword" 劍 (ken) (short form from "End of the sword" 劍先 (ken saki) ), "Flickering light" 搖光 (yôkô), or again "Star of military defeat" 破軍星 (hagun sei), because travel in the direction of this star was regarded as bad luck for an army. In Theosophy, it is believed the Seven Stars of the Pleiades focus the spiritual energy of the Seven Rays from the Galactic Logos to the Seven Stars of the Great Bear, then to Sirius, then to the Sun, then to the god of Earth (Sanat Kumara), and finally through the seven Masters of the Seven Rays to the human race. The Lakota people call the constellation Wičhákhiyuhapi, or "Great Bear"."